Iraq is helping to shore up the besieged regime of Syrian President Bashar al-Assad by allowing Iranian arms and fighters to cross into Syria from Iraq, Secretary of State John F. Kerry charged Sunday. 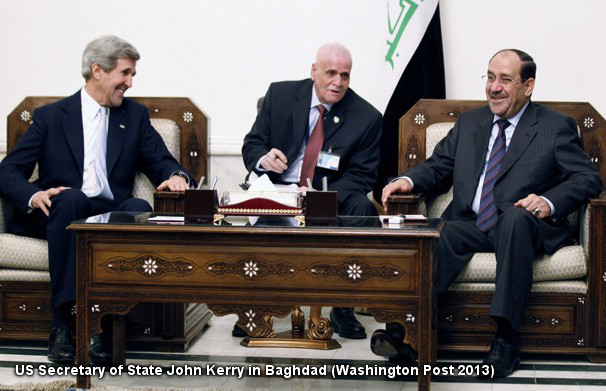 During an unannounced trip to Baghdad, Kerry lobbied Iraqi Prime Minister Nouri al-Maliki for greater scrutiny of flights that cross Iraq. He appeared to make little headway with Maliki, a Shiite with long ties to Iran and little inclination to do U.S. bidding 10 years after the American invasion that toppled dictator Saddam Hussein. Fighting in the area has intensified in recent days as rebels backed by Nusra Front fighters gain territory. The radical Islamist al-Nusra Front has emerged as one of the most effective groups in the Syrian resistance, drawing on foreign fighters with combat experience in Iraq and elsewhere. In December, the U.S. State Department moved to blacklist the rebel group as a foreign terror organization linked to al Qaeda in Iraq. It is beyond doubt that the West and its regional allies are now doing just that - bolstering militant groups sympathetic to Al Qaeda, and the 3,000 tons of weapons were funneled primarily, and intentionally into the hands of Al Qaeda's al-Nusra front. Disturbing then, that Kerry is demanding that Iraq cease alleged aid being sent to Syria to fight these extremist groups - groups the US sent over 4,000 of its own sons to fight and die during the 10 year occupation of Iraq and Afghanistan, and extremists who were allegedly behind the death of 3,000 Americans on September 11, 2001, tipping off a costly and unending "War on Terror." The absurdity of Secretary John Kerry's demands, and the unraveling agenda he now represents, set new lows for American foreign policy and will irreparably damage America's image globally for many years to come. The insidious campaign pursued versus Syria, now at this juncture, has damaged Western interests and global standings to such an extent that even victory tomorrow would not avert or blunt the lasting ramifications of its willful, murderous, hegemonic aggression.